Buying a condo is pretty much like purchasing a regular home, but with one big difference is that mortgages are tougher to come by. Here we will discuss the two condo mortgage rules you need to know so you can feel secure when buying a condo. NSH Mortgage has the wisdom and tools to help you understand the two mortgage rules for purchasing a condo. Lenders impose a different set of mortgage rules that you will need to follow when you purchase a condo. They rules may at times increase your interest rate. The most experienced and professional mortgage lenders can help you navigate the condo financing maze. A mortgage lender who is looking out for your best interest can help you beat the system. With condos and co-ops, it is not just your credit-worthiness the lender has to worry about. It must also verify the fiscal and physical health of the entire development into which you are buying. Fortunately, with the housing market in recovery and condo values climbing, mortgage lenders allow looser guidelines, even low down payment home loans. Assume that these guidelines for condominium and housing cooperative financing opportunities to remain in high value all throughout 2017. Most home buyers use conforming mortgage financing. This means that their loan purchased by one of two government sponsored entities, Fannie Mae or Freddie Mac, and that the loan meets the two group’s minimum standards. Fannie Mae and Freddie Mac utilize the term warrantable to define condominium projects and properties against what they will require to allow for mortgage opportunities. No individual entity owns more than ten percent of the units that are included in a project, including the developer. At least 51% of the units are owner occupied. The homeowners association (HOA) is not named in any lawsuits. Common non-warrantable properties include condotels, timeshares, fractional ownership properties, and other projects which require owners to join an organization, such as a golf club. Manufactured housing projects and other developments which are not legally considered real estate are also removed from warrantability. These include house boat and motor home projects. When buying a condo, ask your real estate agent or lender about the building’s warrantability before you go any further. 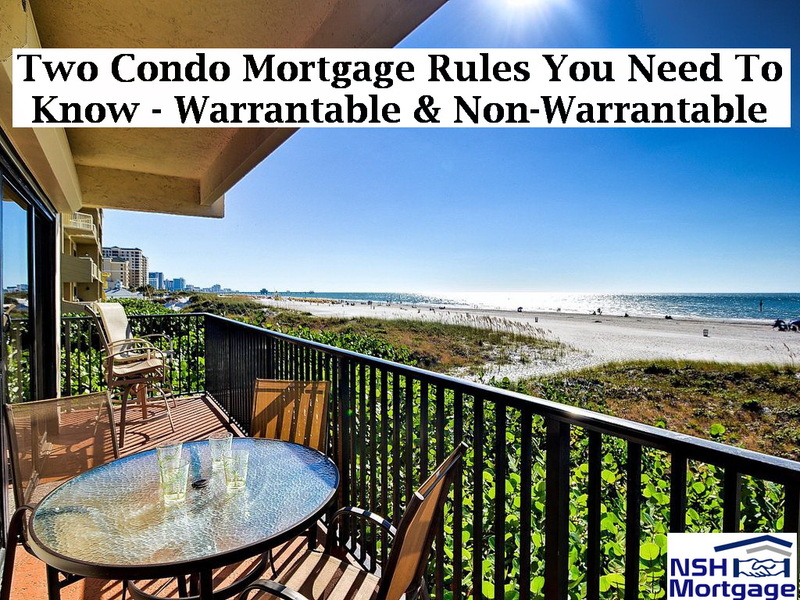 A warrantable condo typically gets you lower mortgage rates than a non-warrantable condo. Warrantable condos create lower risk for the bank. VA home loans and FHA home loans are government backed mortgages. FHA loans are insured by the Federal Housing Administration. VA loans are loans guaranteed by the Department of Veterans Affairs. Both loan types are known for their more flexible lending guidelines than conforming mortgage financing. Loans are available in all 50 states. The FHA loans and VA loans maintain lists of approved communities, but do not despair of the unit you want is not in a development on those lists. The borrowers are required to meet standard FHA mortgage loan guidelines. At least half of a project’s unit must be owner occupied. In a newly built project, at least 70% of the units must be sold. For instance, if Fannie Mae or Freddie Mac have already approved a building, the FHA loans and VA loans will also authorize lending there. Neither the FHA loans nor the VA loans charge borrowers extra to finance a condominium or a co-op. You can get a condo loan with the exact same FHA mortgage rates or the VA mortgage rates as you would with any other single family home. Its developer has not turned over control of the HOA to the owners. The community allows short term rentals. A single person or entity owns more than 10% of all units. It is in a project where most of units are rented to non-owners. Additionally, a condo unit in a project involved in litigation of any kind is usually considered non-warrantable. This is true whether the community is the plaintiff or the defendant in the suit. Non-warrantable condo financing is not available through Fannie Mae and Freddie Mac, or through the FHA or the VA mortgage loan agencies. To receive a non-warrantable condo mortgage, you will need to speak with NSH Mortgage today. Three Important Factors You Need To Know Before Making A 20% Mortgage Down Payment.